Uralla: 22 km from Armidale; 88 km from Tamworth. 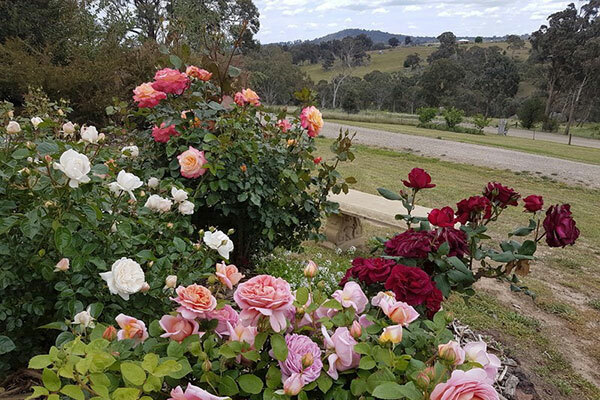 A beautiful 5-acre property just 2 minutes to Uralla town, and 15 minutes from Armidale and the University New England. The Cottage — spacious 2 bedrooms, fully self-contained, verandah, carport and room to roam, sleeps up to 6. The Gostwyk Room — beautifully furnished private room with ensuite, deck and car space, suitable for one person or a couple. Evening meals by prior arrangement, with local wine and beer list. Grace Cottages — keep warm and cosy! Two cottages on 5 beautiful acres. Hidden at the end of a no-through road, yet only 2km from Uralla, Grace Cottages are quiet, and very private. Both self-contained cottages accommodate couples, luxuriously appointed with outstanding views. Breakfast provisions are included. If you are looking for a place to relax and unwind, you'll feel warmly welcome at Grace Cottages. King-sized bed in 'A room with a view'. Queen-sized bed in 'A cottage for two'. A rural escape for adventurers and artists on a beautiful property with tranquil views. Sleeps two people.